I have started over more times than I can remember. 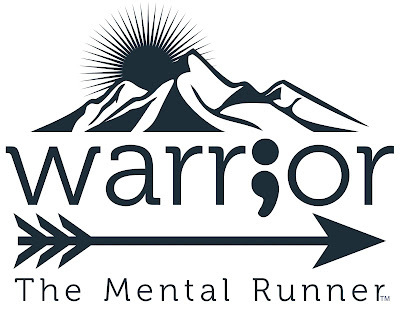 Mostly because of the stigma associated with mental illnesses, the people I have talked to have said that when they slide back into a depressed, anxious or manic state, they feel like it is some sort of personal failure. I don't see it that way at all. I don't see it as a weakness. I don't even see it as a negative anymore. It is simply part of who I am and part of the process. In the past, starting over has been described differently and called different things, depending on who I was talking to. A therapist I saw once called it relapsing back into negative thought patterns. Two psychiatrists said the same thing that my body had built up an immunity to the medications, and they needed to be changed. Emergency room physicians have said that I had crossed into a dangerous manic episode before admitting me into their hospital's mental ward. Again, relapsing into depression, anxiety or mania has just been part of the process for me. I had to make peace with it. Sometimes, even when I did everything right, my brain chemistry still took a turn for the worse. That's okay. Other times, when I looked back on it, I realized that it may have been possible for me to have done a few things better. I want to put the odds in my favor as much as possible. That's why I have a plan of action now. 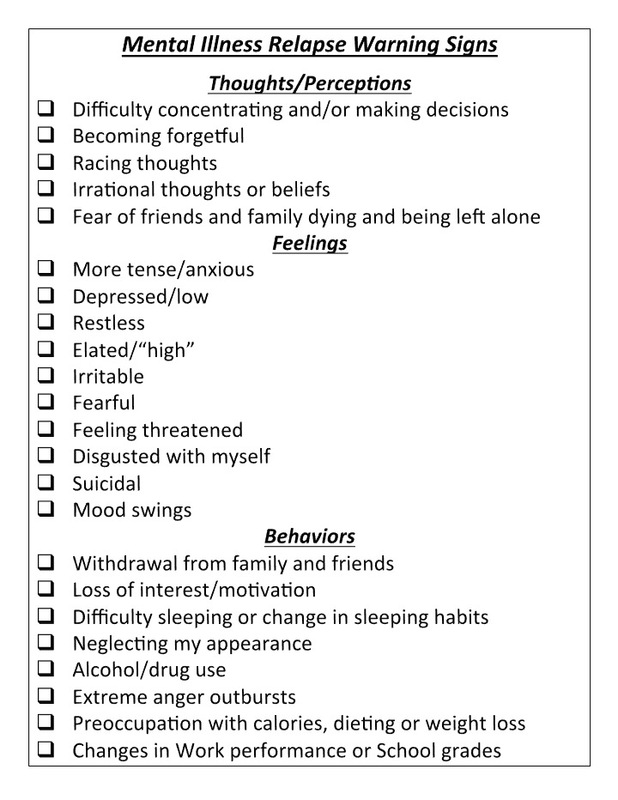 A doctor gave me a relapse warning sheet, so that as soon as I think I may be headed downhill, I can start checking it off to see where I am at. I designed it in a Jpeg format and put it below, in case anyone wants to click on it to print it off. That helped me immensely because it is so easy for me to lose perspective and not realize what is happening until it is too late. Now, when I use that sheet and realize something is wrong, I put my plan into action. I immediately call my doctor and seek her advice. Then, I review a list that I made of positive actions I can take. I keep this list, and the Mental Illness Relapse Warning Signs sheet, in a place where I see them often. When I’m feeling overwhelmed or unwell, I pick them up and get to work. I call my doctor. I choose a helpful activity from my list and set aside time to do it. I also make sure to stay away from anything on my list of activities to avoid. 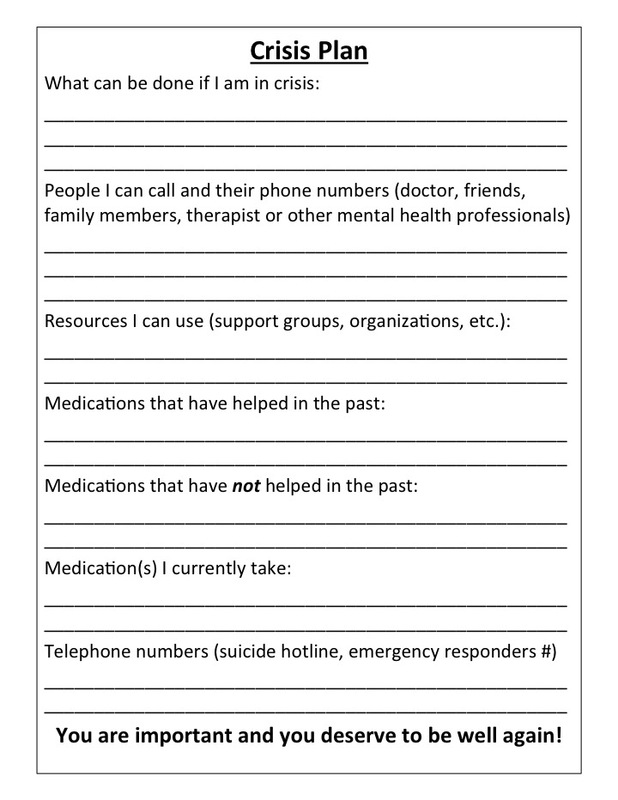 Finally, in case of emergency, I have a crisis plan filled out. The same doctor that gave me the Warning Signs sheet gave me this one. I have put it below in Jpeg format in case anyone wants to click on it to print it off. Having a crisis plan brings me additional peace of mind because I know, even if everything does go wrong, I still have a plan. Exercise, eating healthy foods, wellness activities, a warning signs checklist, a helpful and nonhelpful activities list, and a crisis plan are a must for me. Having a plan of action has brought me an enormous amount of peace of mind. As always I wish you wonderful mental health and great successes with eating healthy meals. If you, or someone you love, is severely depressed or anxious, please click the link to the right and you will be directed to the International Association for Suicide Prevention. It is a great resource and is staffed by wonderful people.